LURA: Charlie, what are you doing under the desk? Get out of there. LURA (crawling under desk to reach Charlie’s mouth): What do you have in your mouth? LURA (extracting small night light bulb from Charlie’s mouth): Give me that. We do not eat light bulbs. CHARLIE: We don’t? Are you sure? CHARLIE: Can I just lick it? LURA: No, I don’t even know how you got this, I threw it away months ago. 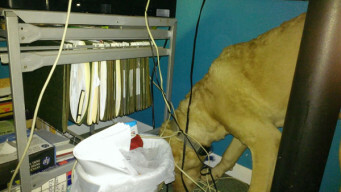 CHARLIE: It was laying right out in the open behind the printer stand in the nest of electrical cords. If you don’t want me to have something, don’t leave it under the furniture!